A common issue for people who are looking to start their journey on YouTube and other video sharing platforms is starting out. More specifically the finances required to set up a channel with good quality production. I don’t have a fancy computer and I certainly don’t have any high-value products for my recording. Instead, all of the software I got was for free and the equipment I have in today’s market must be worth no more than £100. So what will you need to begin your journey if you’re looking to make YouTube videos? How do I make mine since I’m on Linux? This is a journey into Open Source Software doing what it does best: Surprise people. First of all, it should be said that my machine obviously cannot record the latest and greatest games. In the past, when I was on a heavier version of my operating system, I recorded me playing a game called Secret of the Magic Crystals. It wasn’t great, as the game froze once or twice and there was a large black bar across the top of the video, but the commentary I provided caused some chuckles at the time. As such, it should be stated that you need to have a relatively powerful machine to do things and you should minimise the amount of activities going on in the background as much as you can. Once you’ve gotten this far however, it’s time for you to choose a game to play. Indie games are a favourite amongst the internet and on YouTube, indie horror games go even further – So be sure to keep up to date with the games that people are playing if you want to be found quickly. If you just want to record your adventures and put them up for the world to see, such as our Stonekeep series, then you might want to consider playing a game you know well, or at least relatively well. Now, on my rig, I have had to ‘make do’ with the software I could find. I decided to capture the video and the audio separately so I use two very lightweight programs for this. 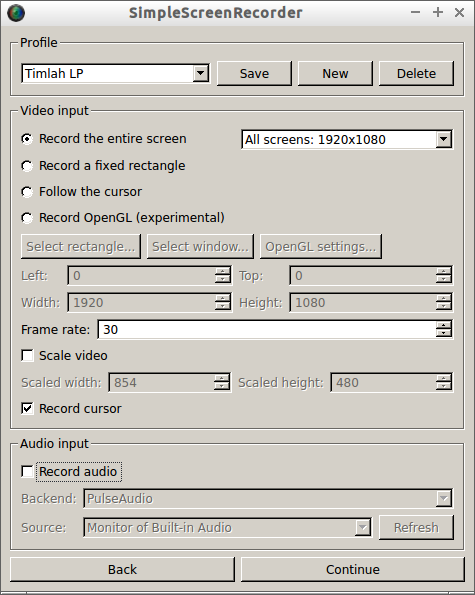 For audio, I use a program aptly called Audio Recorder. I’ve included a link to it here as you can unpack and run it even in Windows if you install some software. For information on unpacking a .tar.gz file, check out this post. .tar.gz is a common way to zip (tar) and compress (gz) a file in Linux. 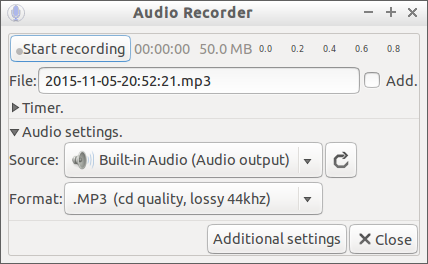 Audio Recorder is great as it can pick up from several sources: Your microphone, your computers sound (Audio Output) and more. Because I keep my video and audio separate (I found compatibility issues with my sound being run through PulseAudio), I disabled Record audio. It also means I have a bit more control over the sound I have and can do more creative cuts with editing later down the line. I set these going and I also get one last program going for my vocals. Are there easier ways of doing all this? Absolutely! For my set up however, this is a pretty good way to work it. The last program I get going for my vocals is one that Linux and Windows users alike are very well used to: Audacity. I set Audacity to record my line in (microphone) and I had to do a bit of tweaking at first! See, when I started to record my vocals, I noticed that I was only audible in one ear. I thought this was odd, so after some fiddling I realised it was recording mono. If you find this is happening to you, or if you get a recording back in mono, then don’t worry: you CAN fix it. All you have to do is duplicate your audio file, set one of them to your left ear and the other to your right ear, then merge them back together as a mono sound. If you need to know more about this issue yourself, I’d heavily recommend looking up the difference between Mono and Stereo (as obvious as it may sound). I’ve noticed it is prone to bugs, but once you get used to the quirks, it’s really impressive for free software. 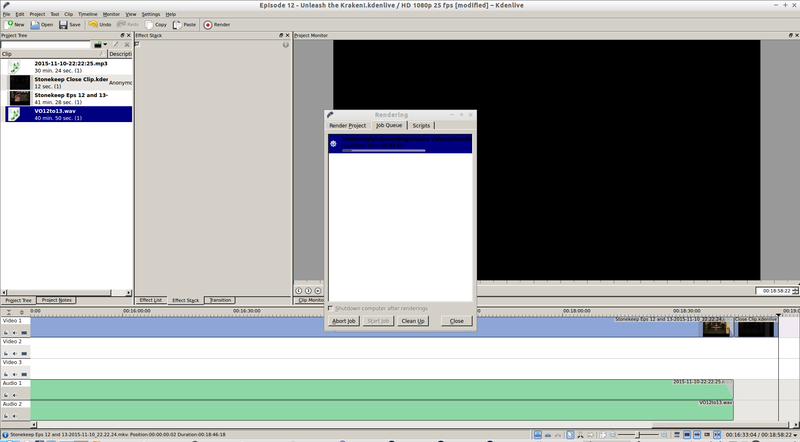 For kinks that I’ve found, I cannot for some reason upload an .mp4 file into a new project! I’d recommend checking out the software and tinkering with it yourself. It has a good website with great resources, which can be found here. If you’re on Windows and don’t know where to start, this is a good starting place. Once you’ve done this, upload your .mp4 file to YouTube and you’re good to go. Hopefully this has given you some food for thought as to what you can do with a little bit of time and patience and hopefully, you’ve realised that Free Open Source Software (FOSS) is a serious alternative to spending hundreds on expensive equipment and software. For animation, I can use Blender, or Pencil2D. For art, I’ve got my favourite, GIMP. Making my own music tracks is easily done with Hydrogen. Now, please don’t hesitate to check out this post which details what’s happened in this weeks GeekOut Plays Stonekeep. Leave your comments on this article below, or over on Facebook and Twitter. This entry was posted on November 11, 2015 by Timlah. It was filed under GeekOut discussion, Linux, Technology, Tutorial, YouTube and was tagged with audacity, Free, Free Audio Software, Free Operating System, Free Recording Software, Free Software, Gaming Channel, kdenlive, Linux, Make YouTube Video, Make YouTube Videos, money, Technology, Ubuntu, Windows, YouTube, YouTube Channel.